Firstly, I have relatively little trouble eating (and ultimatley sustaining on) meatless or near-meatless meals. Actually, I prefer it. But I have to admit the one thing that would keep me from being a full-blown vegetarian is meat-based stock or broth...or what a vegan friend of mine refers to as "meat juice." Rice cooked in water is bland, but cook it in a rich broth and it is a meal unto itself. 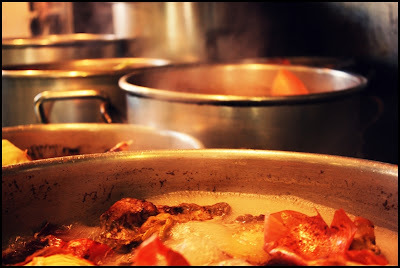 If you have a rich broth and want a soup the flavor is already accomplished...whatever else you add is simply a bonus. I add chicken stock to most things I cook aglio e olio. The famed chef, Auguste Escoffier--whom which chef De Gouy worked under--has said that (and I'm paraphrasing) with a good stock anything can be accomplished. Stock/broth, to me, is a form of alchemy. And I love how the kitchen smells with a broth slowly simmering away (home kitchen or work kitchen). Today at work was slow and I made seven pots of the golden stuff (about 40 gallons) and the kitchen smelled amazing. 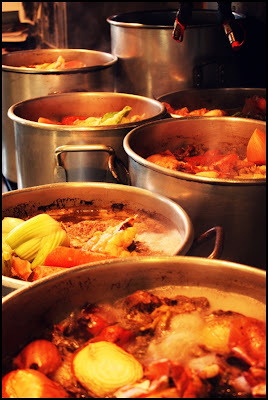 Anyhow, for recipes and lore about soup and stock read this article I wrote for Artvoice a couple years ago. In the meantime...simmer.